Ahh, Star Trek. I grew up with you, I watched all your spin offs, I learned all about diplomacy and crazy hairstyles from you, I’ve even transferred my school girl crush on Shatner’s Kirk to Vic Mignogna’s Kirk. 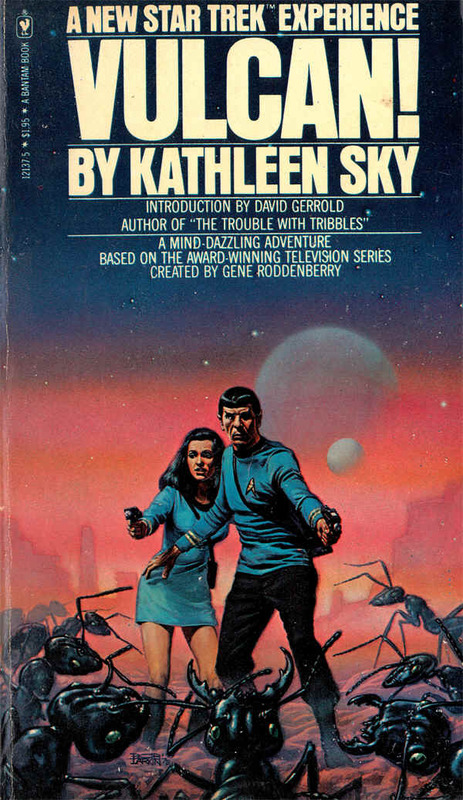 But in all these years, I’ve never read a Star Trek tie in novel. Until now. Browsing at a bookstore with some friends, Vulcan! by Kathleen Sky was pushed into my hands. ok sure, why not? You know sometimes you just need a fun, brain-candy kind of book? Something that is sure to entertain but doesn’t require your brain to do any back-flips? This was one of the books, and the timing couldn’t have been better, because boy was I in the mood for some easy to read candy. The premise is that the Neutral Zone between Federation space and Romulan space is shifting, and a solar system that had always been on the Federation side will soon be on the Romulan side. The Enterprise’s mission is to visit the planet and determine if the life forms there are intelligent or not. On the way, they pick up the Federation’s preeminent expert on zenobiology, Dr. Katalya Tremain. Kirk has been warned that she’s got a difficult personality, but he figures he’ll put on the charm, and she’ll be like putty in his hands. Dr. Tremain beams aboard, sees Spock standing in the transporter room, and freaks the hell out. Apparently “difficult personality” was subtle talk for she’s happily vocal about her bigoted hatred for all Vulcans.